SEATTLE - June 15, 2017 - PRLog -- International bestselling author Lynda Cheldelin Fell hit a publishing milestone with the release of her 25th title in the award-winning Grief Diaries anthology series. "Hit by Impaired Driver" explores the lifelong impact of being hit or having a loved one hit or killed by a drunk, drugged, distracted or impaired driver as seen through the eyes of 19 people. "These stories tell readers who share the same path they aren't alone. The entire series is about understanding, removing isolation, and — perhaps most important — giving hope that if we can survive, readers can too," said Cheldelin Fell. Speaking from experience after losing her own daughter in 2009, Cheldelin Fell first launched Grief Diaries as a radio show in 2014. She hosted the National Grief & Hope Convention in April 2015 in Indianapolis, and then published the first 8 books in the Grief Diaries series in December 2015, and quickly attracted readers from around the world. Growing by over 600 writers and 25 titles in just 18 months, the series has earned four literary awards and accolades by notable figures including Martin Luther King's daughter, Dr. Bernice King, MADD founder Candace Lightner, and National Center for Missing & Exploited Children co-founder Jay Howell. 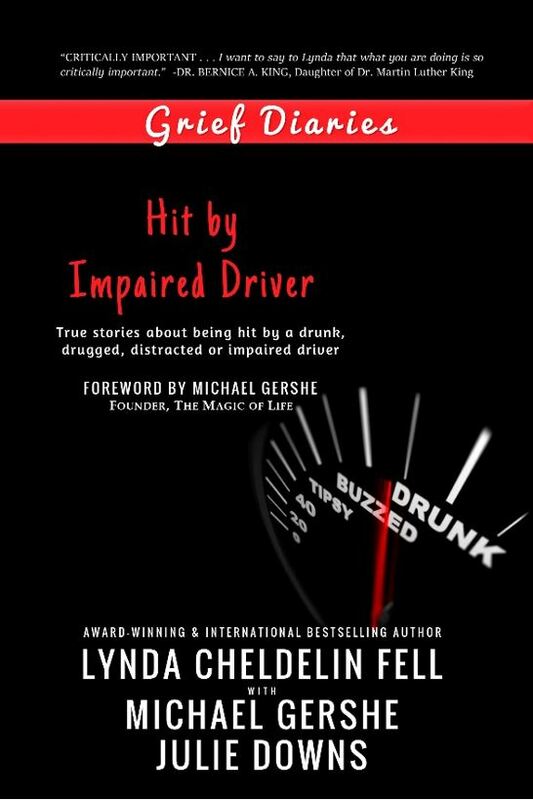 "Hit by Impaired Driver" is coauthored by award-winning author Julie Downs, founder of AVIDD, and comedian Michael Gershe who was 8 weeks old when a drunk driver crashed into his family's car, breaking nearly every bone in Michael's body and killing his mother instantly. Michael created The Magic of Life program which combines stand-up comedy with his story for an inspirational alcohol awareness and impaired driving prevention program. "Grief Diaries is a wonderful computation of stories by the best of experts, the bereaved themselves. Thank you for building awareness about a topic so near and dear to my heart," said Dr. Heidi Horsley, an adjunct professor at Columbia University and co-founder of the national Open to Hope Organization. The book now is available in over 40,000 retail outlets around the world including Amazon and Barnes & Noble.